This week I spoke with the outspoken Debi Gutierrez. She is an Emmy nominated Comedian and star of KCET's 'A Place of Our Own.' In this interview we discussed raising 11-year-olds, respecting audiences, and the secret to keeping men happy. Andrew: How are the kids behaving today? Debi: We only kept one. The other two, out the door baby! You know my rule -eighteen and your gone. Eighteen and you hit the streets. Andrew: How old is the one that you still have around? Debi: Eleven, and that's only because the laws require it. Andrew: [laughs] Did the kids inspire you to get on stage? Debi: The children made me want to get out of the house. Andrew: [laughs] It's interesting to start [a comedy career] after you have a family. Can you discuss that a little bit? Debi: My contemporaries, they would get on stage and just kind of BS. They would take their stage time and get one little gem of comedy, but for me because I was a mom, a home manager, and growing a family - every minute on stage was so important to me. So I made every single time I got on stage count. What could be funnier than family? Motherhood is the second oldest profession in the world. Debi: Prostitution, but, then again, I am a little bit of both. Got to be. Got to keep daddy happy. Andrew: [laughs] Why do you think there is such a disproportionate number of male standup's to female standup's? Debi: The road is hard for a woman, but I have to say, as much as I love my gender, I think women have given comedy a bad name. They get up there and they bash men. They are bitter, and they talk about parts of their body that nobody cares about. Nobody wants to hear about that, so I think some female comics have made it hard for other women to be accepted as funny, intelligent, contemporary and unbiased. And I realized, there is no female comic out there singing the praises of men. And they are so hungry for it! I am getting reactions like; the guys are high fiveing each other in the audience and they are whooping and they are yelling at me like they are watching football. Andrew: [Laughs] You are a chef in some regards. Gourmet Pretzels. How did you possibly combine comedy and pretzels as your life's work? Debi: First of all, chocolate is recession proof. People will always find the money to get chocolate. Like I said, I am a mom, first and foremost and just do all that home stuff. When the first writer's strike took over and my show was in limbo for awhile I had to find a way to support myself and my family. My husband said everybody loves your chocolate covered pretzels. Why don't we start up a little business? And we did. You can find anything about me on www.debiontheweb.com. Andrew: Tell me a little bit about A Place Of Our Own on KCET (PBS). Debi: A Place Of Our Own is an informative talk show. It is absolutely information driven and we talk about raising healthy kids and we won a Peabody. We won the national Peabody and have been nominated three times for the Emmy's. 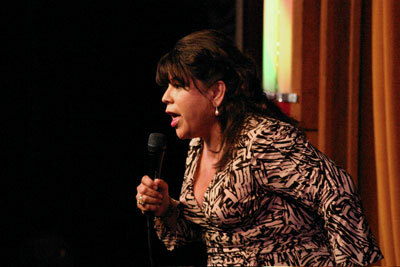 Debi Gutierrez will be Co-Headlining with Alan Havey on Tuesday, August 4th and Wednesday, August 5th 2009. For Complementary Tickets type in Promotion Code: MEN. $1.00 Web Service Fee Applies.